This Cheesy Scalloped Potatoes Recipe is creamy, cheesy, garlicky and the perfect potato side dish to go with any meal! Preheat oven to 400 degrees F. Spray a 9″ x 13″ with non-stick spray and add half of the sliced potatoes, season with salt and pepper to taste and set aside. In a large skillet, melt the butter and cook the onion and garlic until onions are tender and garlic is fragrant, about 3 to 5 minutes. Whisk in the flour until thick, then gradually whisk in the milk and chicken broth. Keep whisking until mixture is smooth and creamy. Season with salt, pepper and fresh thyme. 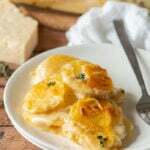 Top the sliced potatoes with half of the cream mixture, then top with half of the sharp cheddar cheese and parmesan cheese. Repeat the layers with more potatoes, the rest of the cream mixture and the rest of the shredded cheeses. Cover tightly with foil and bake for 35 minutes. Remove the foil and continue baking for an additional 25 minutes. Turn the top broiler on for the last 3 to 5 minutes to brown the top if desired. Let the potatoes sit for at least 5 minutes to let the sauce thicken up before slicing and serving. Enjoy! Scalloped Potatoes can be made ahead of time, cooled and refrigerated. Reheat in a 350 degree oven until heated through (about 35 minutes).